Here David prays from a place of total transparency before God. He invites God's very presence to be his vindication. The Message Bible phrases Psalm 17:2 in a way that makes the vindication meaning clear: "Show the world I'm innocent—in your heart you know I am." In verses 3-9 David goes into detail about some of the ways and places he has allowed God's all-seeing presence to probe him. 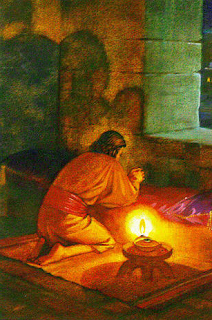 God has visited him in the night and those encounters have yielded no conviction of sin (Psalm 17:3). Who of us hasn't experienced the sense that in the dark of our room, when we'd like to be sleeping but sleep won't come, God is there, sees, all, and we can't hide anything from Him? God has convicted him over his speech so that now he can say, "I have purposed that my mouth shall not transgress" - Psalm 17:3. He has been careful not to go to the wrong places: "I have kept away from the paths of the destroyer…" - Psalm 17:4,5. He has called on God to save him (implied is that he hasn't looked for salvation in other places) - Psalm 17:7. Out of all this comes his confidence to ask for God's protective hiding and covering now "when the wicked oppress and deadly enemies surround" - Psalm 17:8,9. And he can look forward to that final day when he and God will actually meet face to face - Psalm 17:15. Have we ever invited God to examine us to the depths that David did here? Do we share openly with Him in our most private moments, submit our tongues and feet to Him, trust Him (above everything else) for what we need of protection and help? Let's be challenged by David's example so we can echo his confident conclusion: "As for me, I will see Your face in righteousness, I shall be satisfied when I awake with Your likeness" - Psalm 17:15. PRAYER: Dear God, help me to be transparent with You so I have the confidence, in the ups and downs of daily life, to pray along with David: "Keep me as the apple of Your eye; Hide me under the shadow of Your wings." Amen.